...an update on Hinkly Point C.
April's report by the UN Intergovernmental Panel on Climate Change stressed again the urgency of developing low carbon sources of energy to replace dependence on fossil fuels. Of the four new nuclear stations proposed for the UK – Hinkley Point C, Sizewell C, Wylfa and Sellafield (Moorside) – Hinkley Point C in Somerset is the most advanced. 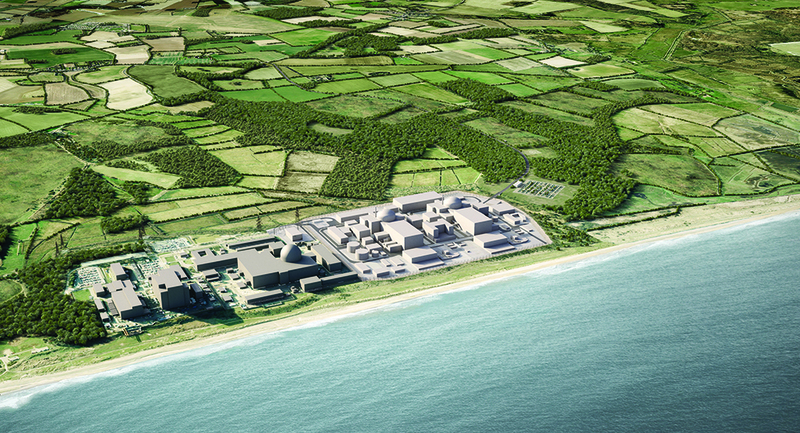 It has design approval from the UK regulator, a nuclear site licence and planning permission for construction. Last October, after lengthy negotiations, promoter EDF Energy finalised a deal with the UK government which would guarantee a minimum price it receives for the electricity generated, as well as giving it access to Treasury-guaranteed debt. The remaining – though significant – hurdle for the project to clear is a European Commission investigation into whether the agreement amounts to illegal state aid. Meanwhile Tidal Lagoon Power applied in February for a Development Consent Order to create an 11.5km2 lagoon in Swansea Bay, with generating capacity of 240MW. The scheme is said to have less environmental impact than the much-debated Severn barrage and could be in operation by 2018. And Kepler Energy, an Oxford University spin-off, recently won a Shell Springboard award which provided £30,000 for a detailed study of an installation of its revolutionary turbines in the Severn estuary. 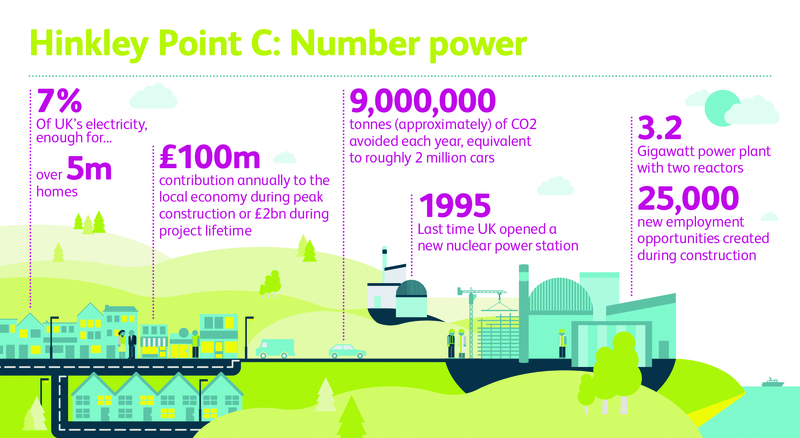 The £16bn Hinkley Point C plant will use two reactors of the European Pressurised Reactor design, generating a total of 3.2MW. They will be the fifth and sixth in the world: one is under construction in Finland one in France – where in both cases there have been delays in construction – and two in China. "The UK and French governments have said they will work together in an effort to persuade the European Commission that the agreement is within the rules. The consequences if they fail could be considerable." The aim of the government’s deal with EDF was to remove the last remaining doubts of investors and kick-start construction with the intention that the plant would be commissioned and generating electricity by 2023. This is around the time the oldest advanced gas cooled reactors, Hinkley Point B and Hunterston, will be nearing the end of their lives. Investors, subject to a final investment decision scheduled for July (though this may be at risk from the European inqury), are: EDF Group (with a 45-50% stake); Areva (10%); China General Nuclear Corporation and China National Nuclear Corporation (30-40%). Other interested parties may take a stake of up to 15%. Areva has been integral in the construction of all the existing EPR projects and it was announced alongside the agreement with the Government last October that it had won one of four major contracts on the project, for nuclear steam supply equipment, instrumentation and control, and fuel. Alstom is to supply two 1,750MW steam turbines, together with other non-nuclear construction work..
A joint venture of Bouygues and Laing O’Rourke has won the main civil engineering contract, valued at over £2bn. Costain has been awarded the contract for cooling water outfalls, consisting of three marine tunnels of 7m diameter and totalling around 11km in length. Both contractors plan to begin work as soon as possible after the final investment decision. A joint venture of Kier and BAM has awarded the contract for site preparation works, worth over £100m. All this, however, depends on the outcome of the European Commission inquiry, which could still undermine the whole programme. The inquiry, launched in December, will decide whether the agreement between the Government and EDF constitutes illegal state aid. Officially EDF says the project timetable remains unchanged. But with the commission’s conclusion not expected until summer or autumn, there is a strong likelihood that the deadline of July this year by which EDF and its partners planned to take the final investment decision on the project will be missed. The Hinkley contract is the first example of a contract for difference, effectively a feed-in tariff, being introduced as part of the Government’s energy market reforms. It sets a “strike price” for electricity generated by Hinkley Point C of £92.50/MWh (reduced by £3/MWh if Sizewell C goes ahead). If the wholesale electricity price is below this price, the generator receives a top-up payment. If wholesale prices rise above the strike price, the generator reimburses the Government. The contract will last for 35 years from the date of commissioning of the plant, with the strike price indexed to inflation via the consumer price index. The project will also be protected from unforeseen changes in the law or government policy. EDF Group and its partners will bear the risk of constructing the power station to budget and schedule. The Government and EDF claim the agreement equates to a rate of return of around 10%. EDF and the Government say that the investigation was expected, and that it is progressing satisfactorily. The UK and French governments have said they will work together in an effort to persuade the commission that the agreement is within the rules. The consequences if they fail could be considerable. The University of Greenwich’s Prof Thomas says: “The commission’s initial view appeared very negative. It could be hard to withdraw from that position.” On past experience, he added, the commission was more likely to impose conditions rather than reject the contract outright – for example it could require a shorter contract or set conditions on the loan guarantee. “It might limit the contract to 20 years, for example,” he said. “But if it did that, the project might not be financeable.” That could spell the end of the entire nuclear programme: “If Hinkley doesn’t get through, nothing will get through,’ he said. A year from now construction of the UK’s first tidal lagoon power scheme could be under way in Swansea Bay. Three years after that the scheme could be generating 320MW – the equivalent of around 160 typical onshore wind turbines and enough to supply 9% of the electricity needs of Wales. In no previous era could such a scheme have attracted backing, he says. Even when climate change began to rise up society’s priorities, the first recourse was to more established technology such as wind farms. The scheme’s promoter applied for development consent in February this year; it has gone out to tender for the main construction contracts; and a number of financial backers are closely scrutinising the project, which appears to possess many of the benefits of a Severn barrage without its environmental drawbacks. Mark Shorrock, chief executive of the project’s promoter and developer, Tidal Lagoon (Swansea Bay) plc, believes the lagoon is “an idea whose time has come”. Now, however, it is possible to generate the risk capital to get such a scheme off the ground. “20,000MW of capacity is going off line in the coming years, most of it high carbon content. We’re an island nation with the second highest tidal range in the world. It’s obvious that we should be harnessing something that’s low risk, but we needed capital that was prepared to take a risk, to take this first one through all the hoops we’ve been through over the last three years. We will have spent £20m by the time the project reaches financial close,” says Shorrock. Those three years have been spent producing “a well thought-through” civil, electrical and mechanical package that can be costed accurately by prospective contractors and built for a price that can generate the right return for investors, says Shorrock. Key partners include Atkins on front end engineering and design. Costain is engaged on early contractor involvement on civils. Van Oord undertook initial breakwater design, which was tested by HR Walllingford. ABP Marine Environmental Research (ABPmer) was responsible for coastal process modelling. The final proposal, whose cost is estimated at £925M, is to construct a 9.5km U-shaped breakwater within Swansea Bay, enclosing an area of 11km2 of water. Power would be generated by 16 turbines linked to 20MW-rated generators – essentially the same technology as used at the 47-year old La Rance tidal power scheme in France, though one aspect of the design work undertaken for the lagoon project has been the use of computational fluid dynamics to squeeze an extra few percentage points in efficiency from the turbines. The next year will be crucial for the project. Tendering on the two main contract packages – one civil, one electrical and mechanical – is under way, with contract award expected by the end of summer. In parallel, since February the scheme haas been going through the planning process. The consultation period over the application is now closed and the project now enters the 4-6 month examination period. A recommendation to the secretary of state for energy and climate change will be made before Christmas with a decision in the first quarter of next year, allowing construction to start in the second quarter. The first electricity would be generated in 2018. Doubling the length of the breakwater wall could increase the area of impounded water by a factor of five, but a project on this scale was considered too big for the first venture. This would bring the price of electricity generated down to a level comparable with nuclear. With the project having a 120-year design life, it has an ideal cash flow profile for pension funds, providers of savings such as index-linked bonds, and the like. A number of large banks, pension funds and infrastructure funds are currently carrying out due diligence with a view to investing in the project. Construction is straightforward, involving building a large cofferdam in which the turbine house will be built in dry conditions. The breakwater will have a core formed of sand-filled Geotubes (made by composites/geotextiles firm TenCate) protected by rock armour. The project’s environmental impact statement makes up around 4,500 pages of the 5,000-page application for development consent. Shorrock says the project will have “no discernible effect” on coastal processes; mortality of fish will be less than 1%. There will be an effect on marine ecology due to the loss of sand and gravel which will be excavated from within the lagoon; however the breakwater will be a good habitat for bivalve molluscs and lobsters. There will be an improvement in water quality in Swansea Bay because the project will have to take steps to deal with the main sewer outfall from Swansea, which after heavy rainfall discharges untreated sewage into the sea. On prices, Shorrock says the project will be viable at an electricity strike price of £155-160/MWh – about the level of offshore wind. For subsequent lagoons, economies of scale will apply: doubling the length of the breakwater wall could increase the area of impounded water by a factor of five, but a project on this scale was considered too big for the first venture. This would bring the price of electricity generated down to a level comparable with nuclear. If the ambitions of a second renewable energy developer are achieved, the proposed tidal lagoon could soon be joined by a “tidal fence”. Kepler Energy, a spinout from Oxford University, recently won a £30,000 Shell Springboard award which will allow it to take development of its new transverse horizontal axis turbine to the next stage. 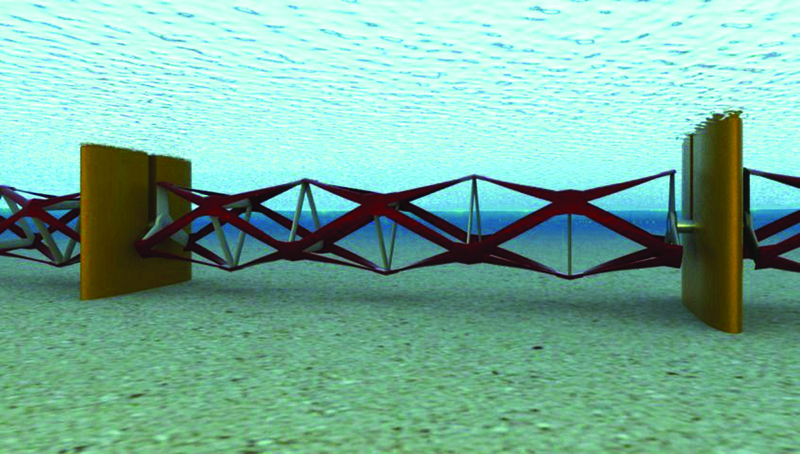 The “second generation” turbine generates electricity from the flow of tidal currents and has a number of unique features which give it an advantage over a conventional axial flow turbine (that is, like a wind turbine mounted on the sea bed) for several reasons. First, it presents a rectangular shape to the flow, providing a greater effective area for generating. Second, its efficiency is improved by the blocking effect on the flow – it behaves like a weir on the sea bed, effectively producing a head of water – which extracts potential energy as well as kinetic energy. Finally, the patented turbine rotor, which in appearance slightly resembles the cutting cylinder of a giant lawn mower, is designed as a triangulated truss and so is self-supporting, spanning between bearings at each end. It is envisaged that in practical installations, pairs of rotors, each 60m long and 10m in diameter, would be combined with a generator in a single 130m long unit. Each unit would develop around 4.4-5.3MW at flow velocities of 2-2.5m/s. “In the same space you could put 10 axial flow turbines but there would have to be a generator and control set for each, mounted integrally with the turbine underwater. We would have a single generator with all the electrical equipment in a waterproof column, in the dry,” says Dixon. The turbines are optimised for a water velocity of 2-2.5m/s, lower than other types of turbine but more typical of flows in coastal waters worldwide. Apart from the Severn Estuary/Bristol Channel, suitable locations exist for example south of the Isle of Wight and off East Anglia, while worldwide, much of the coastlines of Korea and China have the right characteristics. Kepler’s plan is to build turbine units in long lengths – hence the description “fence”. In the Bristol Channel north of Minehead a fence around 14km long, generating over 600MW, could be constructed without getting into too deep water or reaching as far as the shipping lanes. The Shell Springboard award will fund additional research, to be led by Professor Guy Houlsby, head of Oxford University Department of Engineering Science and Kepler Energy technical director. The research programme is expected to last around six months, with results released in phases. “We expect to have something to say very rapidly on one fence in isolation,” says Dixon. Overall the research should allow a robust business case to be developed. How soon could the project progress to construction? Dixon’s ambition is for construction to get under way in 2017 or 2018. Initially a demonstrator, capable of generating up to 30MW, would be built. Under the the DECC’s contracts for difference regime, tidal stream projects up to this capacity qualify for an electricity strike price of £305/MWh, after which the price drops to the level of offshore wind power (£140/MWh in 2018). Construction is relatively straightforward and the environment in the Bristol Channel is relatively benign, compared with true offshore construction.